An ultra luxury residential project at the cusp of Delhi and Noida, this is a place to redefine new-age nobility. You get an impressing space of 6-10,000 sq ft along with expansive landscape, clubhouse, and state of the art amenities. 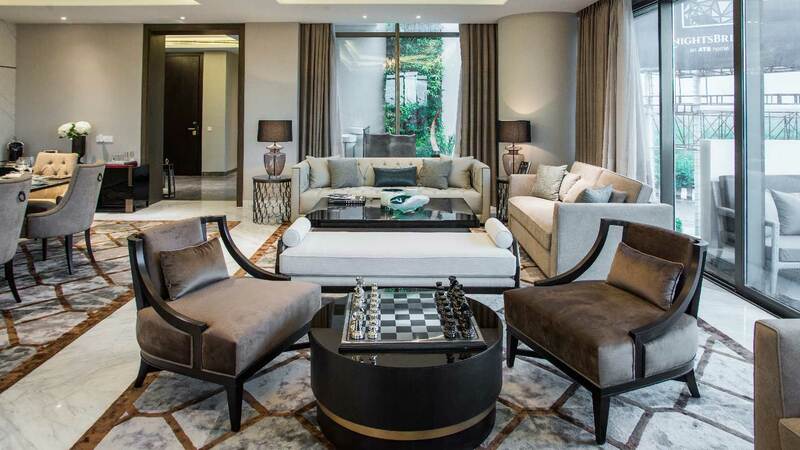 Designed by Hafeez Contractor, Knightsbridge is a true masterpiece. Escape the city pollution in this green haven in sector 150 Noida. This expanse of nature is surrounded by golf greens yet well connected to the major haunts of the city. You can jog across tree lined avenues, go for a refreshing swim or tee-off at the 9 hole golf course. Villas here are 5-8,000 sq ft. Designed like a sanctuary, ATS Pristine offers a glorious retreat from the urban humdrum. 11 acres of the area has been dedicated solely to greenery. You can claim a space of 23-3,200 sq ft of your own for a budget of Rs 1.15 cr. Check out some more reasons here why we are sold on this location. This is a low-density layout, meaning you have more surrounding space and less crowded housing area. The units are designed in a Spanish style architecture and have space anywhere between 1,625 sq ft to 3,200 sq ft.
Get a grandiose view of the Yamuna Expressway from the high towers of ATS Allure. The township is spread over 100 acres and you can get a unit of 1,150 sq ft to 1,350 sq ft for around Rs 42 lakh. Make your dream of owning a home come true at Jeevan Geet apartments. Located at Bulandshehar, on the outskirts of Greater Noida, you can get a 2 BHK apartment here for around Rs 11 lakhs. What’s more? All basic facilities such as school, bank, hospital, and markets are located just 10 minutes away.